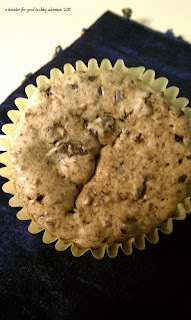 I discovered another potentially delicious blog called Sticky Gooey Creamy Chewy this past weekend. Maybe it was just coincidence that a large box of Girl Scout Cookies had come in the mail for my sister (they had been MIA for quite a while, finally we had a tracking number). Maybe it was just coincidence that I had a box of Thin Mints already in my freezer from my local Girl Scouts (my sister 'imported' her cookies from a troop in Illinois). In any case, I made a half batch of these Thin Mint Mini-Cheesecakes (click here for original recipe). The half-recipe made 7 cakes. Just enough for small desserts this week but not too many. A few minor changes from the original recipe: 1) used reduced fat cream cheese 2) used jumbo chips (what was on hand) but chopped them. I now feel that almost any cookie could be put into a mini-cheesecake. And why not?